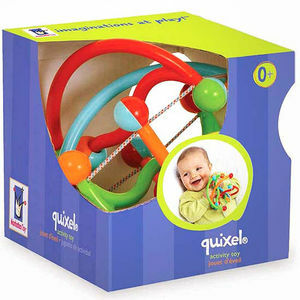 This recall includes the Manhattan Toy Quixel baby rattle. About 8,300 rattles in the U.S. and 4,100 in Canada are included in the recall. The plastic rattles have four, colored arches (red, orange, green and blue) with sliding beads on each of the arches. The arches are held together by a single string of red, white and blue elastic. The rattle arches measure about 5 inches in diameter. The product was sold with or without a box. "Manhattan Toy" is printed on one of the arches. \\\\n\\\\nManhattan Group has received four reports of the rattles breaking. Specialty toy and baby stores nationwide, in Canada and online at www.manhattantoy.com from September 2011 through October 2013 for about $15. Immediately take these rattles away from young children and return it to the store where purchased for a full refund. Call Manhattan Group at (800) 541-1345 or visit online at manhattantoy.com for more information.